“Change is possible, Natives in Charge of their Narrative. Red Nation Film Festival is a program of Red Nation Celebration Institute. 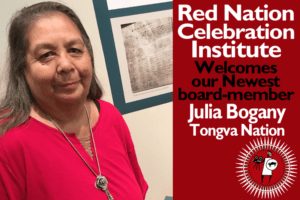 Red Nation Celebration Institute and its founder and board of directors have inspired others for 23 consecutive years, transforming the way America sees American Indian & Indigenous peoples thru film, music, art, dance and ground-breaking programs and initiatives. Red Nation Celebration Institute founded the American Indian Heritage Month in the City of Los Angeles and in the State of New Mexico was officially recognized by the State of California, City of Los Angeles and State of New Mexico, the first native film festival RED NATION FILM FESTIVAL in the entertainment capital of the world and has now become the most prestigious venue for experiencing native cinema in its 14 season, the first and only LIVE broadcast of a native awards show RNCI Red Nation Awards, to the first and only American Indian parade downtown Los Angeles, Native FILM Market, to the Indigenous Women RISE Climate Change March, to Native Women in FILM, Native Youth Matter If I Can See It I Can Be It, and the first online steaming media company Red Nation Television Network all Native content, including RNCI year round programs and initiatives. We are the first to say, this work will not be completed in our lifetime, yes we have come a long way but still have much to do. 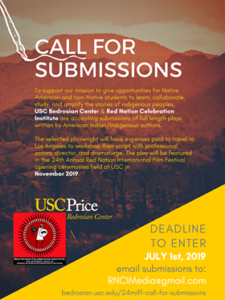 We need your support to past these values and initiatives on to the next generation and with American Indian Heritage Month in the City of Los Angeles (founded by RNCI 2006) and now with Indigenous Peoples Day (founded by City of Los Angeles 2017), there is even more hope. Natives in Charge of Their Narrative is a challenge and one that Red Nation Celebration Institute has and is actively taking on however Hollywood’s film industry has an opportunity to meet these challenges with authentic organizations like Red Nation Celebration Institute, We know that we are up to the task but we must demand change and ask leaders to include our narrative and image in front of and behind the camera. It is empeartive for future generations to see themselves in a contemporary modern way. Today with Native youth suicides, and murdered and missing women and human traffing, we believe part of the problem stems from lack of inclusion. Join us November 5-16, in Santa Monica and Beverly Hills for the 15th Red Nation Film Festival & Awards 12 days of cinematic excellence – its more than a film festival.